Francis was the son of a wealthy and devout family at Pesaro in Italy. After the death of his parents, while he was still a youth, he became the master of a considerable estate. This might have been a dangerous occasion for many a young man to give himself over to a life of pleasure; but his earlier Christian training taught him how much bitterness is frequently associated with such a course. Francis chose rather to follow the advice of Christ to the young man in the Gospel, so that he might attain to Christian perfection. He divided the greater part of his inheritance among the poor; the remaining part he used to build three hermitages and at each of these a chapel in honor of our Blessed Lady. A hospice for poor travelers and pilgrims was added to one of these hermitages. 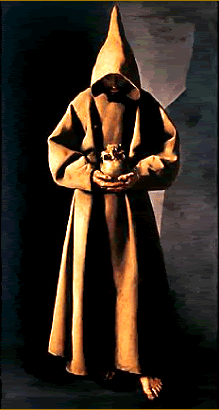 Then he was invested with the habit of the Third Order of St Francis and lived a holy life as a hermit, devoting himself to prayer and the works of charity. The tempter did not fail to offer inducements to make Francis return to the world. When he did not succeed with his plans, he endeavored to take Francis’ life. One night while the holy man was at prayer, the devil rolled a heavy rock down from the mountainside toward his hermitage. The rock would surely have buried the hermit under the ruins, but it was held suspended on the side of the mountain, and no harm came to the praying hermit. His devout life did not remain a secret. Soon disciples came to him, and Francis did not have the heart to send them away. He trained them in his devout exercises, and went out humbly to the neighboring town to beg the necessities of life for them. Because he had won the esteem of everyone, he often obtained more than they really needed. One day when he was returning with the provisions he had collected, two men met him and insulted him by calling him a hypocrite and an idler, who abused the simplicity of the faithful and grew rich at their expense. God immediately chastised the offenders, the one became paralyzed and the other was struck dumb. Francis actually reserved for himself and his brethren only so much of the alms he received as was needed by them; the rest he distributed among the poor. God glorified His servant by many miracles and the gift of prophecy. The veneration which the people paid to him was so great that it was considered a privilege even to touch his habit. After living the life of a hermit for more than fifty years, he died peacefully in the Lord in the year 1350. The entire town of Pesaro was present when his body was placed in a tomb in the cathedral, where it is still an object of veneration at the present day. Pope Pius IX approved the celebration of his feast.